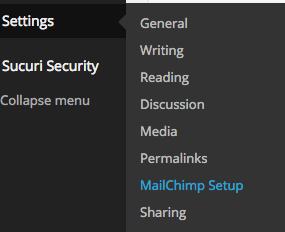 After creating your list in MailChimp, all you have to do is install the plugin via your WordPress administrator panel. 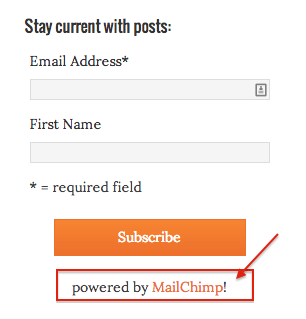 MailChimp Plugin in WordPress Dashboard – Yeah, no image!!! Once you install the plugin it’ll be embedded within the Settings menu, I always hate this, but I suppose it works. I was a bit annoyed, but mostly because I’m a bit of a premadonna, but refusing to allow a cool feature to be ruined I pinged them via the WordPress.org Support Forums. They responded very fast, always a good sign!! Turns out disabling the affiliate link is even easier, just disable the Monkey Rewards feature under List Option. I can live with that. Once that was done, all I had to do was move the MailChimp widget into the appropriate sidebar and I was off the races. While we have not finished a review of the plugin, I do have other controls in place that might affect you as well. If you’re leveraging the Sucuri Website Firewall you might have issues when first connecting, depending on your configurations. If you get an error like the following, don’t freak out, it just means your security configurations are working. No worries, this has to do with the restrictions on the Admin panel, all you have to do is navigate to [Your Domain] > Settings > Security and under Security Options disable the Admin panel restricted to only Whitelisted IP addresses. Once this is disabled, takes a few seconds, try again and the connection should go through. Once the connection is established, reenable the feature and your website will be none the wiser.